I love custard pudding. I added pumpkin to my mom's original custard pudding recipe. I hope you like it! 1. Put butter in a microwavable cup and microwave it until it melts. 2. Put all the ingredients including the melted butter into a food mixer. 4. Bake at 335F (170C) degrees for 45 minutes. 5. 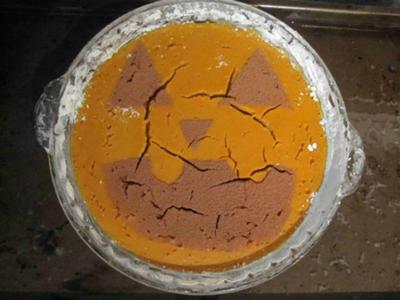 Cut a jack-o-lantern face out of paper and sprinkle cocoa powder on the top of the paper on the pudding for a cool Halloween effect.